A special section of the Asiatische Studien / Études Asiatiques, edited by Michal Biran and titled "In the Service of the Khans: Elites in Transition in Mongol Eurasia" appeared in November 2017. The issue includes papers of Michal Biran and many alumni members of the Jerusalem Mongol project: Daniel Zakrzewski, Or Amir, Choi Soyoung, Francesca Fiaschetti, Florence Hodous, Geoffrey Humble, Vered Shurany, Ishayahu Landa, Cho Wonhee and Yang Qiao. The exact content can be download here. Two new papers of Dr. Yoichi Isahaya, our team member, appeared recently. Isahaya, Yoichi and Jyuh Fuh Lin, “Entangled Representation of Heaven: A Chinese Divination Text from a Tenth-Century Dunhuang Fragment (P. 4071),” Historia Scientiarum 26/3 (2017): 153–171. Isahaya, Yoichi and Mitsuaki Endo, "Persian Transcription of Yuan Chinese in the History of China of the Jāmi‘ al-Tawārīkh (Ms. Istanbul, Topkapı Sarayı, Hazine 1654)," The Economic Review 経済研究 9 (2017), pp. 123–161. A new paper of Ishayahu Landa, our team members, appeared recently. The full text of the article is available to the download via the hyperlink below. A paper of Ishayahu Landa, our team member, appeared recently. Ishayahu Landa, "Imperial Sons-in-Law on the Move: Oyirad and Qonggirad Dispersion in Mongol Eurasia," Archivum Eurasiae Medii Aevi 22 (2016), pp. 161-198. Jonahan Brack, “Was Ede Bali a Wafāʾī Shaykh? Sufis, Sayyids and Genealogical Creativity in the Early Ottoman World,” Andrew C.S. Peacock and Sara Nur Yildiz (eds. ), Literature and Intellectual Life in Islamic Anatolia, 14th-15th centuries (Würzburg: Ergon Verlag, 2016), pp. 333-60. Qiu Yihao, “A Short Report on Qaraqorum in al-Yūnīnī’s Dhail Mir’āt al-Zamān: on the Contemporary Arabic Maritime Merchants of Marco Polo,” in Xu Zhongwen, Rong Xinjiang et al. (eds. ), Make Boluo Yangzhou Sichou zhi lu (Beijing: Beijing University Press, 2016), pp. 327-342. Additionally, a new translation of Dr. Isahaya appeared as well: Nasrollah Pourjavady, Yoichi Isahaya (trans. ), "Izutsu's Interest in Iranian Mystical Philosophy." In Towards a Philosophy of Co-Existence: a Dialogue with Iran-Islam (2), Journal of International Philosophy, Extra Issue 7 (2016): 68–77. A new paper of our team member Dr. Florence Hodous, titled "Clash or Compromise? Mongol and Muslim Law in the Ilkhanate (1258-1335)", has appeared in the Studies on the Iranian World II: Medieval and Modern, A. Krasnowolska, R. Rusek-Kowalska, eds. (Krakow: Jagiellonian University Press, 2015), pp. 187-196. The file is uploaded on this website on the permission of the author. 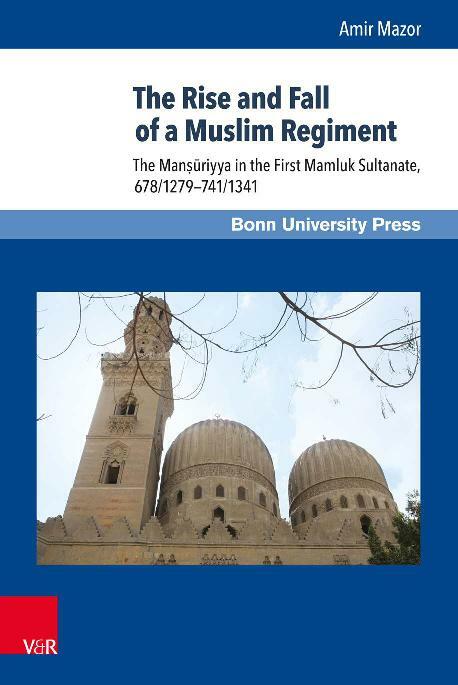 This book focuses on the Manṣūriyya regiment, the mamluks of sultan al-Manṣūr Qalāwūn. It traces the lives of these mamluks during the career of their master Qalāwūn (ca. 1260–1290), the period they ruled the Sultanate of Egypt and Syria de jure or de facto (1290–1310), and their aftermath, during the third reign of sultan al-Nāṣir Muḥammad b. Qalāwūn (1310–1341). Based on dozens of contemporary Arabic sources, the book traces the political and military events of the turbulent Manṣūriyya period, as well as the basic military-political principles and socio-political practices that evolved during this period. It suggests that the Manṣūriyya period marks the beginning of the demilitarization, or politicization, of the Mamluk sultanate. The paper investigates some aspects of Yuan diplomatic rhetoric on the basis of diplomatic correspondence with Annam and Koryŏ, as reported in the Yuan shi and in other Chinese documents from the Yuan period. These sources show that Qubilai’s diplomacy was constructed on Mongolian patterns of foreign relations and representations of charismatic rulership. At the same time, the founder of the Yuan dynasty promoted his imperial identity by adopting several topoi of Confucian rhetoric in order to gain legitimacy in the eyes of the neighbouring lands as successor to the Song dynasty. By showing the entanglement of these two perspectives, the paper demonstrates the necessity to go beyond the sole context of Chinese culture, and the idea of sinicization, when reading Chinese sources on the Yuan. In doing so, the paper contributes new ideas to the ongoing debate on the analysis of periods of non-Han rule in China. 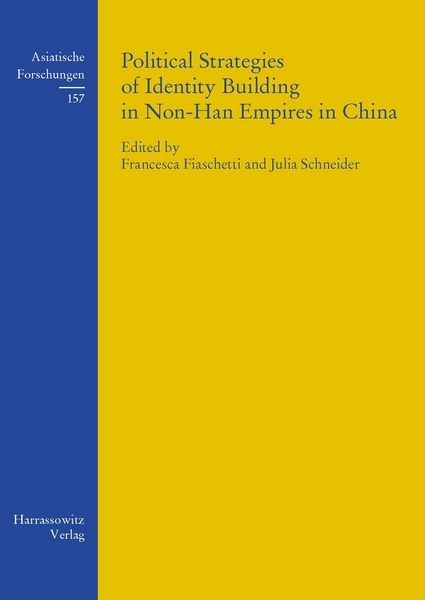 A new book, Political Strategies of Identity Building in Non-Han Empires in China, co-authored by our team member Francesca Fiaschetti was published by Otto Harrassowitz Publishing House in August. The book includes two pieces written by Francesca: Introduction, co-authored with Julia Schneider (pp. 1-8) and The Borders of Rebellion: The Yuan Dynasty and the Rhetoric of Empire (pp. 127-146). Long periods in Chinese history were determined by non-Han conquest rule. With this volume, which emerged from a workshop held in Munich in 2012, its editors and contributors aim at removing the blinders imposed by modern histories and their national boundaries, both territorial and intellectual, and at challenging the way in which we have thought and written about Chinese history so far. 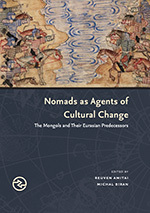 All chapters take a close look at the ways non-Han rulers, be they Jurchen, Mongols, or Manchus, used their specific cultural-ethnic backgrounds to strengthen their power in East Asia. Moreover, through a syncretic approach to the rhetoric and ideologies of other groups under their rule, the emperors and ruling elites developed invigorating methods to deal with the multi-ethnic and multi-cultural compositions of their often huge empires, whose influence is to be seen even in nowadays China. Only if we take their Inner and Northern Asian backgrounds into account will we be able to fully understand the historical and cultural impact of these dynasties on East Asian history. By doing so, the analysis of these periods must necessarily move beyond the focus of a China-centered narrative and take into account that the non-Han and Han identities of conquerors and conquered populations coming into contact became part of each other’s histories. A closer look at these mutual influences will also enhance our understanding of these crucial historical periods beyond the limits of a perspective solely oriented towards ethnic and political boundaries. A new article, "Reading the Yuan Sky: Semu Astronomers and Cultural Exchange in Yuan China", was published recently by the member of our team, Yang Qiao, in the 14th volume of the Journal of the Yuan History [Yuanshi Luncong 元史论丛]. The full text of the article in Chinese can be downloaded from our website by the permission of the author. Yang Qiao, "Reading the Yuan Sky: Semu Astronomers and Cultural Exchange in Yuan China” (解读元朝的天空——色目天文学家与元代文化交流), Journal of the Yuan History (Yuanshi Luncong 元史论丛) 14 (2014), pp. 390-401 (published in Chinese). A new article, "The Quriltai as a Legal Institution in the Mongol Empire", published by our project's member Florence Hodous appeared recently in the vol. 56 of Central Asiatic Journal. The full text of the article can be found here by the permission olf the author. The legal nature of the quriltai can be seen from the fact that it gave legal force to decisions, whether these were about succession, military campaigns, or legal trials. Good attendance at a quriltai allowed the decisions taken to be perceived as legal as well as binding on all who had participated. Thus, the quriltai and the collegial decision-making underpinning it are valuable evidence of how the Mongols perceived legality and practiced law. Hodous, Florence. "The Quriltai as a Legal Institution in the Mongol Empire," Central Asiatic Journal 56 (2012/2013), pp. 87-102. A new book, co-authored by team member Daniel Zakrzewski has just been published. 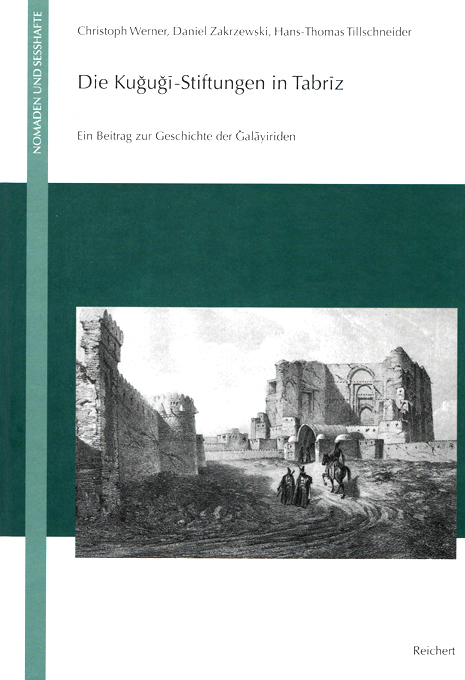 Die Kujuji-Stiftungen in Tabriz: Ein Beitrag zur Geschichte der Jalayiriden (Wiesbaden: Dr. Ludwig Reichert Verlag, 2013), by Christoph Werner, Daniel Zakrzewski and Hans-Thomas Tillschneider, includes an Arabic edition, translation into German and extensive commentary of a waqf deed from 780/1380 Tabriz. The waqf founder, Khwaja Shaikh Kujuji, was a political advisor to the Jalayirid rulers of post-Ilkhanid Tabriz, aw well as a poet, and a charismatic sheikh. The study sheds new light on the post-mongol history of Iran and the early history of the Safavids.